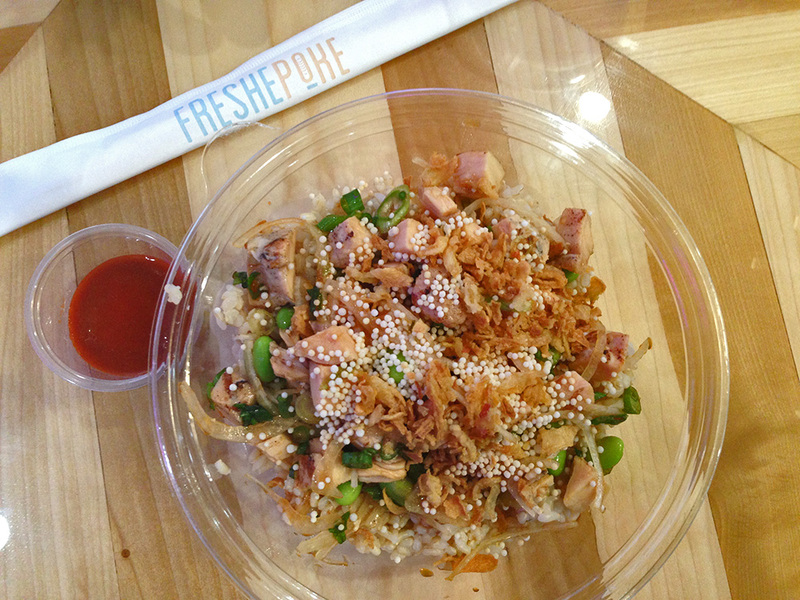 Freshe Poke is one of those places that kind of does for sushi what Chipotle, Moe’s, etc. have done for the burrito, which is deconstructed the rolled food, put it into a bowl, and make it choose your own ingredients fast food style. Just as burrito places were taking over around ten years ago, now is the age of the sushi bowl. That’s not necessarily a bad thing. These poke bowls are filling, fresh (hence the name), and no more expensive than other higher end fast food restaurants (I probably paid about $12-13 when it was all said and done). 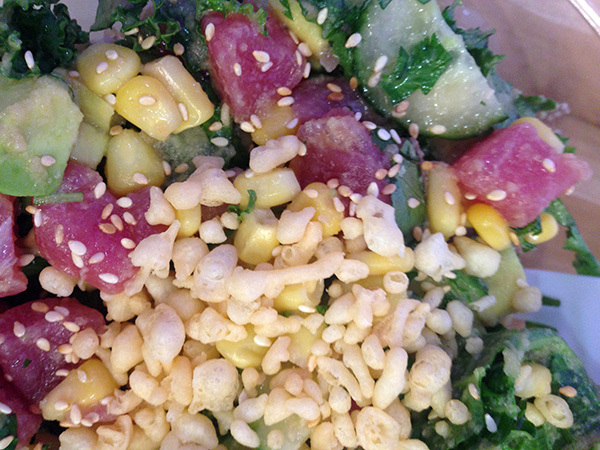 I wrote a while back about Poke Bros. To-Go and might have to choose Freshe Poke over them. Of course, that might be simply because Freshe Poke has seating, and when I went to Poke Bros., my friend who I was meeting for lunch failed to tell me about the “To-Go” part. I wasn’t thrilled about having to find a random place in Five Points to sit down and eat outside in the summer heat. 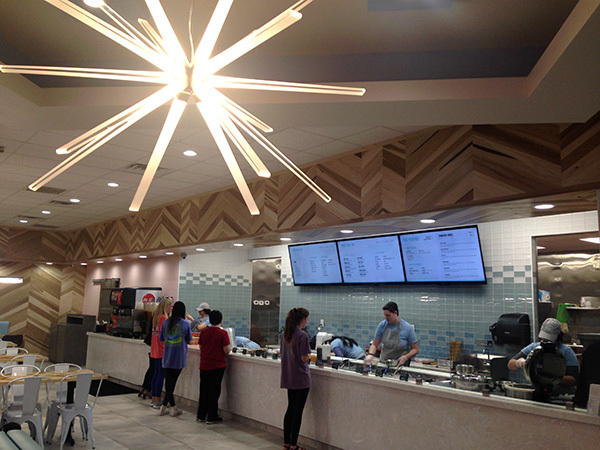 Anyway, unless you’re a quasi-homeless hipster down in Five Points, you’ll find Fresh Poke to be a more convenient and comfortable experience. The night that I went to Freshe Poke, I was actually craving hibachi chicken, but my friend Cristin kept throwing out Freshe Poke in the list of places that we could go and the location was more convenient, so I decided that I would pretend that my poke bowl was hibachi. Lucky for me, they have a (cooked) teriyaki chicken bowl, so I went with that to try to simulate the hibachi experience. While it was no hibachi chicken, it was good, lighter, and I felt cleaner after eating it. Present me took a hit by eating the healthier food so future me could feel better. 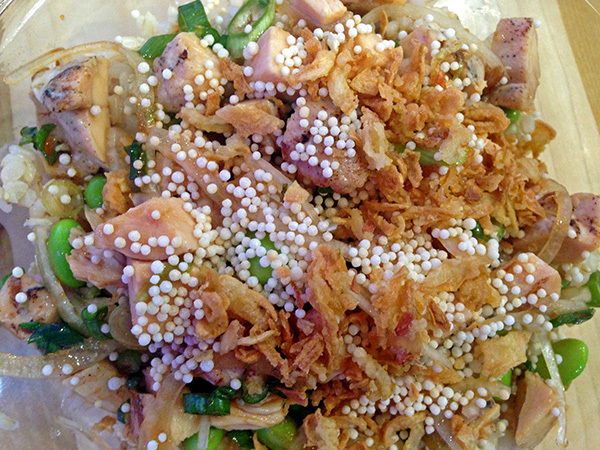 Teriyaki chicken poke bowl that I was pretending to be hibachi chicken. It was actually good. Cristin went with a more authentic poke bowl, one that actually had raw fish in it, and seemed to enjoy her bowl very much. The options and possibilities are endless. When ordering, you can have your bowl customized to whatever ingredients you wish, which is what Cristin did, or you can get one of their specials that takes the decision making out of the process, which is what I did. Cristin’s poke bowl with the sushi and stuff. One other thing to note, the restaurant feels clean. It’s spacious, open, and relaxed. I also appreciated that it was quiet. 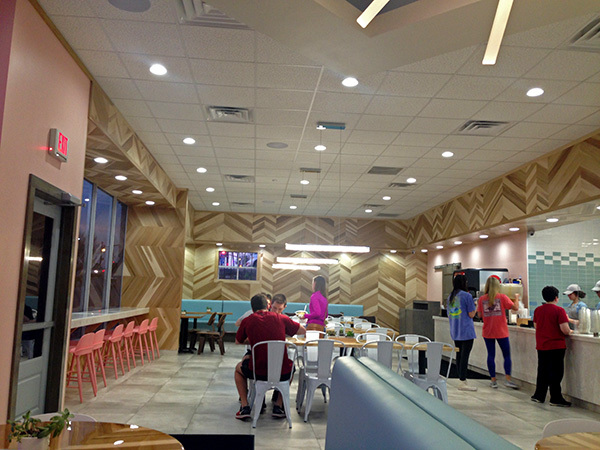 It’s a nice space where you can take your time eating and catch up on life with your friend. 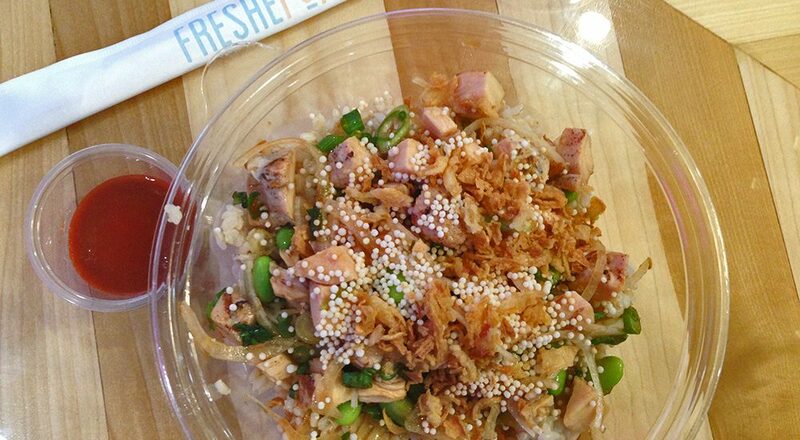 All in all, if you’re looking for something quick and healthy, Freshe Poke is a good place to go. 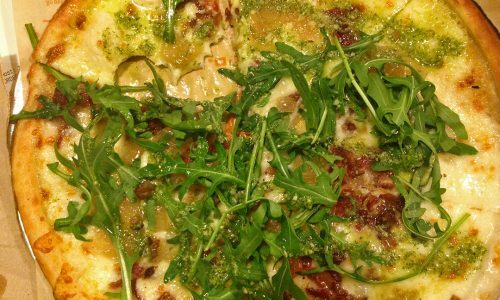 You don’t have to like sushi to enjoy it and no matter how picky you are, you should be able to find something there that you like. We’ve been podcasting! Check out this episode of the First Community Podcast where we talk about missions in Haiti with Zach Pippin. Let’s chat! Tell us your thoughts in the comments section below. 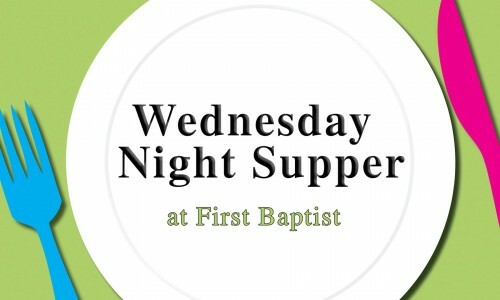 If you are a church member and restaurant owner and would like for us to come visit your restaurant, e-mail me here. Or, if there’s a place you’d like for us to check out before you spend your money, let us know in the comments below. We want to hear from you! Hi! I’m April. I work on staff here at FIRST designing a bunch of things for print and Web. I believe that world peace can be achieved over a pan of fresh baked biscuits and everyone coming to faith in Jesus. Ok, really it’s just Jesus, but the biscuits help.